The parking division at Joe’s Towing & Recovery handles the parking permits for several campus management companies. Here are some of the most frequently asked questions about Parking Permits that we receive. Where does the parking sticker go? This is by far the most frequently asked question we receive at our parking division. All parking permits have the location on the back of the permit, and it is also located in all Vehicle Parking Registration forms. 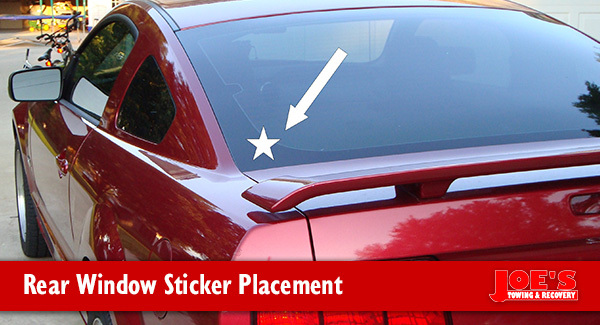 If you are looking at the rear of your vehicle, the permit goes in the lower left corner of the rear window (NOT the side windows). If you have a pickup with a topper, convertible or soft-top, or heavy tint (as in the case of the Mustang shown below), the permit should be placed in the lower left corner of the front windshield. 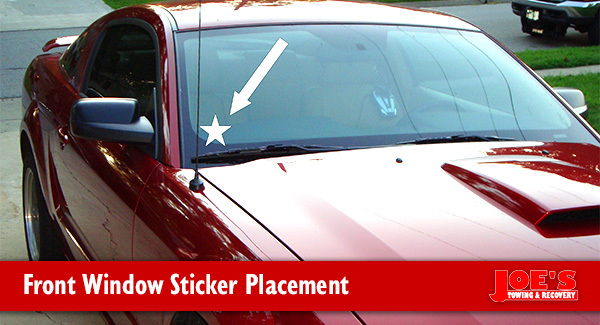 Placing the sticker in any other location will subject the vehicle to tow at the vehicle owner/operator’s expense. Our Normal office handles all campus-related parking issues, including issuing parking permits and is located at 1207 Warriner St, Normal IL 61761. DO NOT PARK in the parking lot for TEAM Automotive. Your vehicle will be towed at your expense. Hours for parking permit related issues: 8:30am – 5:00pm Mon-Fri & 9:00am – 3:00pm Sat. The office is closed on Sundays and Holidays. New Car? Need a new permit? What this ordinance means to you, as a tenant: We can no longer cancel/void an existing permit without the current permit holder present to sign the void permit form. The only exception is a termination of tenancy, which requires a signed statement from your management that the person who had the permit is not longer a tenant of the apartment. If you need to make changes to the vehicle you have registered, or to get a new sticker, you must go in person to 1207 Warriner, Normal. You will need the registration for the vehicle you want the sticker for, a drivers license or picture ID, and proof of residency at the apartment (lease, utility bill, etc). There is a $5.00 fee for all parking sticker changes. If you lose a sticker, there is a $5.00 lost sticker fee. If the vehicle remains the same, but the license plate changes, please have your sticker number available and call 309-454-2481. They can handle license plate changes over the phone. The parking sticker department at Joe’s Towing & Recovery can issue you a “Replacement Parking Permit” for up to 4 weeks. You must have a current, valid parking permit for the address you are requesting the temporary for, and it must not be in the parking lot. The fee for a Replacement Parking Permit is $5.00. Guest parking permits are available at most (but not all) addresses on campus for a fee of $5.00. Guest permits are valid for ONE NIGHT only, and are not issued prior to the day you are needing it. You must know the description (make, model, color and license plate number) of the vehicle that you are wanting to park in the lot. Guest permits are valid until noon the day after they are issued, and you must go in person to Joe’s Towing at 1207 Warriner. If your car has been towed, please see the appropriate Impound Release Instructions on our Frequently Asked Questions page.